Proprietary ebook formats and rights restrictions are holding consumers back. This post originally appeared on Publishers Weekly. Imagine buying a car that locks you into one brand of fuel. A new BMW, for example, that only runs on BMW gas. There are plenty of BMW gas stations around, even a few in your neighborhood, so convenience isn’t an issue. But if one of those other gas stations offers a discount, a membership program, or some other attractive marketing campaign, you can’t participate. You’re locked in with the BMW gas stations. This could never happen, right? Consumers are too smart to buy into something like this. Or are they? After all, isn’t that exactly what’s happening in the ebook world? You buy a dedicated ebook reader like a Kindle or a NOOK and you’re locked in to that company’s content. Part of this problem has to do with ebook formats (e.g., EPUB or Mobipocket) while another part of it stems from publisher insistence on the use of digital rights management (DRM). Let’s look at these issues individually. I’ve often referred to it as Amazon’s not-so-secret formula: Every time I buy another ebook for my Kindle, I’m building a library that makes me that much more loyal to Amazon’s platform. If I’ve invested thousands or even hundreds of dollars in Kindle-formatted content, how could I possibly afford to switch to another reading platform? It would be too inconvenient to have part of my library in Amazon’s Mobipocket format and the rest in EPUB. Even though I could read both on a tablet (e.g., the iPad), I’d be forced to switch between two different apps. The user interface between any two reading apps is similar but not identical, and searching across your entire library becomes a two-step process since there’s no way to access all of your content within one app. This situation isn’t unique to Amazon. The same issue exists for all the other dedicated ereader hardware platforms (e.g., Kobo, NOOK, etc.). Google Books initially seemed like a solution to this problem, but it still doesn’t offer mobi formats for the Kindle, so it’s selling content for every format under the sun — except the one with the largest market share. EPUB would seem to be the answer. It’s a popular format based on web standards, and it’s developed and maintained by an organization that’s focused on openness and broad industry adoption. It also happens to be the format used by seemingly every ebook vendor except the largest one: Amazon. Even if we could get Amazon to adopt EPUB, though, we’d still have that other pesky issue to deal with: DRM. I often blame Napster for the typical book publisher’s fear of piracy. Publishers saw what happened in the music industry and figured the only way they’d make their book content available digitally was to tightly wrap it with DRM. The irony of this is that some of the most highly pirated books were never released as ebooks. Thanks to the magic of high-speed scanner technology, any print book can easily be converted to an ebook and distributed illegally. Some publishers don’t want to hear this, but the truth is that DRM can be hacked. It does not eliminate piracy. It not only fails as a piracy deterrent, but it also introduces restrictions that make ebooks less attractive than print books. We’ve all read a print book and passed it along to a friend. Good luck doing that with a DRM’d ebook! What publishers don’t seem to understand is that DRM implies a lack of trust. All customers are considered thieves and must be treated accordingly. The evil of DRM doesn’t end there, though. Author Charlie Stross recently wrote a terrific blog post entitled “Cutting Their Own Throats.” It’s all about how publisher fear has enabled a big ebook player like Amazon to further reinforce its market position, often at the expense of publishers and authors. It’s an unintended consequence of DRM that’s impacting our entire industry. Given all these issues, why not eliminate DRM and trust your customers? Even the music industry, the original casualty of the Napster phenomenon, has seen the light and moved on from DRM. TOC NY 2012 — O’Reilly’s TOC Conference, being held Feb. 13-15, 2012, in New York, is where the publishing and tech industries converge. Practitioners and executives from both camps will share what they’ve learned and join together to navigate publishing’s ongoing transformation. Several years ago, Steve Jobs posted a letter to the music industry pleading for them to abandon DRM. The letter no longer appears on Apple’s website, but community commentary about it lives on. My favorite part of that letter is where Jobs asks why the music industry would allow DRM to go away. The answer is that, “DRMs haven’t worked, and may never work, to halt music piracy.” In fact, a study last year by Rice University and Duke University contends that removing DRM can actually decrease piracy. Yes, you read that right. I recently had an experience with my digital music collection that drove this point home for me. I had just switched from an iPhone to an Android phone and wanted to get my music from the old device onto the new one. All I had to do was drag and drop the folder containing my music in iTunes to the SD card in my new phone. It worked perfectly because the music file formats are universal and there was no DRM involved. Imagine trying to do that with your ebook collection. Try dragging your Kindle ebooks onto your new NOOK, for example. Incompatible file formats and DRM prevent that from happening … today. At some point in the not-too-distant future, though, I’m optimistic the book publishing industry will get to the same stage as the music industry and offer a universal, DRM-free format for all ebooks. 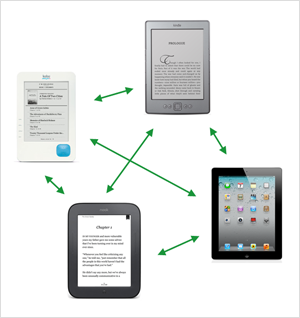 Then customers will be free to use whatever e-reader they prefer without fear of lock-in and incompatibilities. The music industry made the transition, why can’t we?